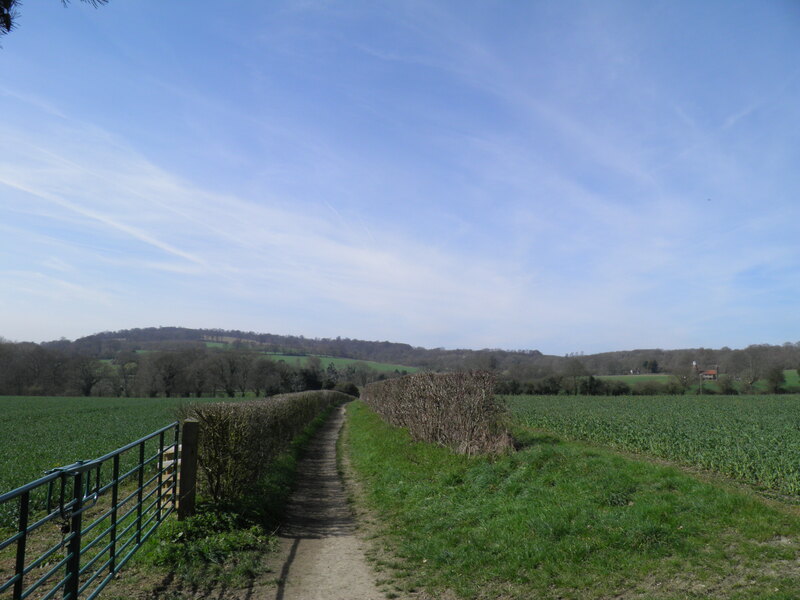 This may be the perfect west Kent walk. 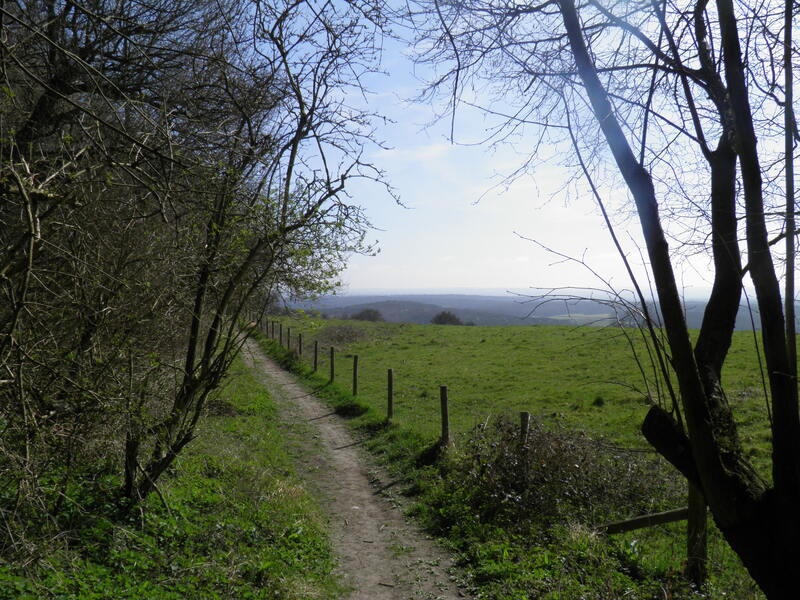 A meander along the Greensand ridge, past historic houses nestling amongst the woods and fields, through picturesque villages ringed by oast houses, and enjoying sweeping views across the Weald. A fantastic way to spend a sunny spring day. Underfoot: Significant parts of this route are either on minor roads or surfaced tracks. There are short stretches through woods that could be muddy after rain, but generally this is an easy walk underfoot. Terrain: Mainly rolling countryside, with gentle gradients. 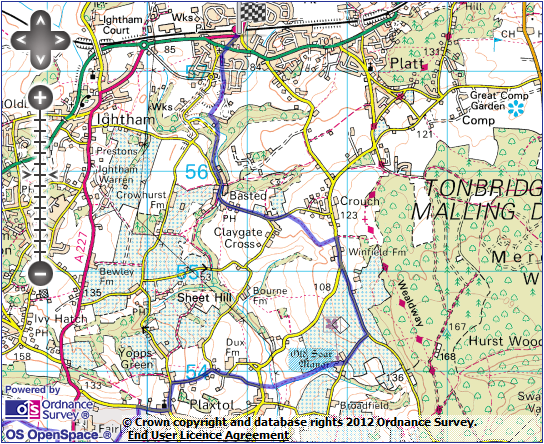 However, there are a couple of steep descents before Ightham Mote and ascents near Old Soar. Getting there: As a major Kentish town, Sevenoaks has frequent services from London. There are 8 Southeastern trains an hour (5 on Sundays) from London Charing Cross (33-52 mins) and London Bridge (22-42 mins). 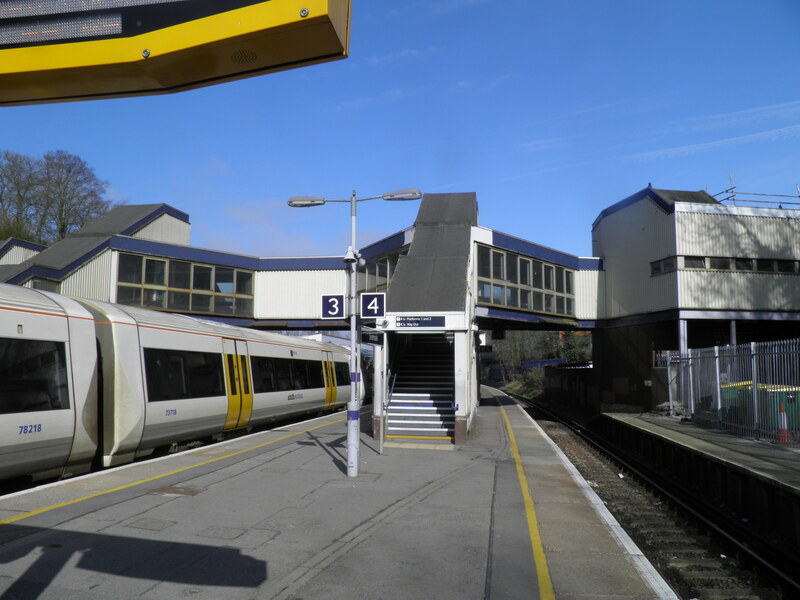 Most trains call at Orpington (9-14 mins) for connections from London Victoria via Bromley South and from Lewisham. 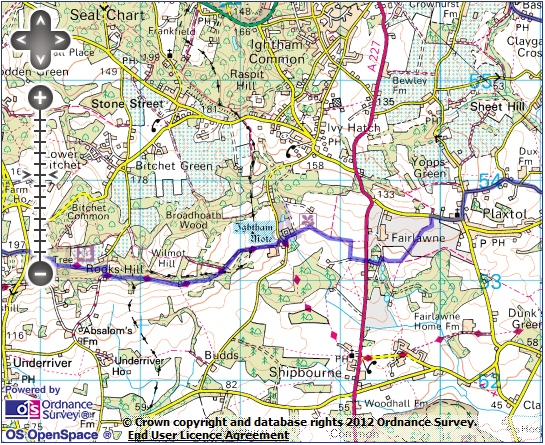 Useful websites: The route includes sections of the Greensand Way. 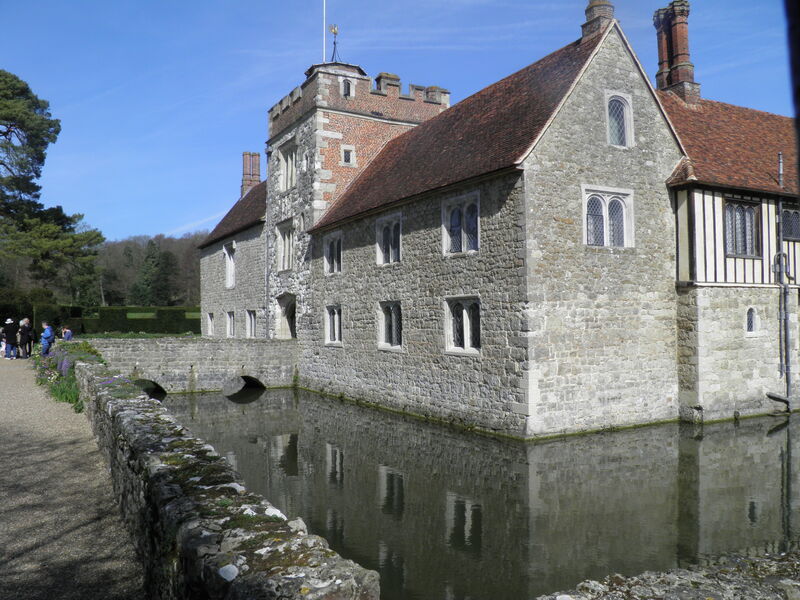 It passes Knole House and its deer park and the historic houses at Ightham Mote and Old Soar Manor. Getting home: Borough Green & Wrotham station has 2 Southeastern trains an hour (1 per hour on Sundays) to London Victoria (42 mins) via Bromley South (25 mins) for connections to London Blackfriars via Catford, Peckham Rye and Elephant & Castle. Fares: Sevenoaks and Borough Green & Wrotham are on seperate lines, so you will need to buy two tickets for these journeys. The cheapest combination is to buy an off-peak day return to Sevenoaks for £10.80 (child £5.40, railcard £7.15) and then a single from Borough Green & Wrotham to Otford for £3.70 (child £1.85, railcard £2.45). 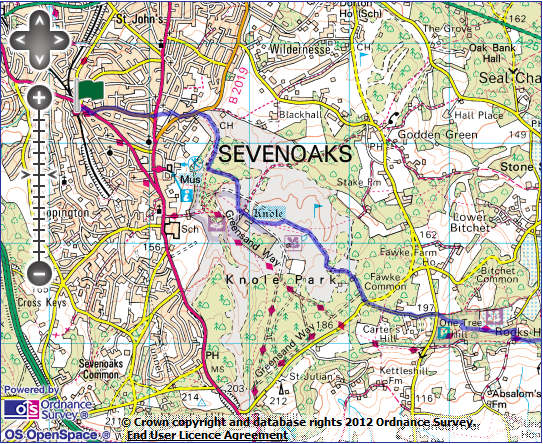 All trains from Borough Green call at Otford, and from this point you are back on a ‘permitted route’ from Sevenoaks. soon enough. At Sevenoaks station follow signs for the way out to the town centre and turn right once out of the station. Take the pedestrian crossing over the main road and continue past the short parade of shops. Take the first road on the left (St Botolphs Road) noting the horse drinking trough in the middle of the junction, and follow this climbing, tree-lined residential street for about 400m to reach the war memorial at the top of the hill. given to the town of Sevenoaks by the Lord Sackville (the owner of Knole House) in 1773. The ground’s legal status is believed to be the origin of the term ‘peppercorn rent’, with The Vine Cricket Club required to pay Sevenoaks Town Council 2 peppercorns per year (one for the ground, one for the 19th century pavilion). In turn, the council must pay, if asked, the current Lord Sackville one cricket ball per year. In another claim to fame, The Vine is thought to be the first place where cricket was played with a three stump wicket, rather than two. 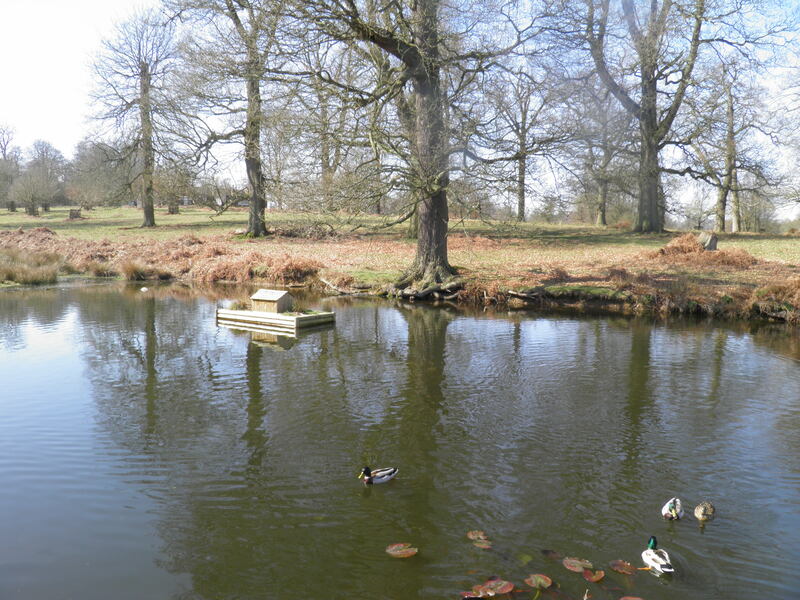 Seven oaks were planted here in 1902, to replace the town’s eponymous oaks in Knole Park. They blew down in the Great Storm of 1987. 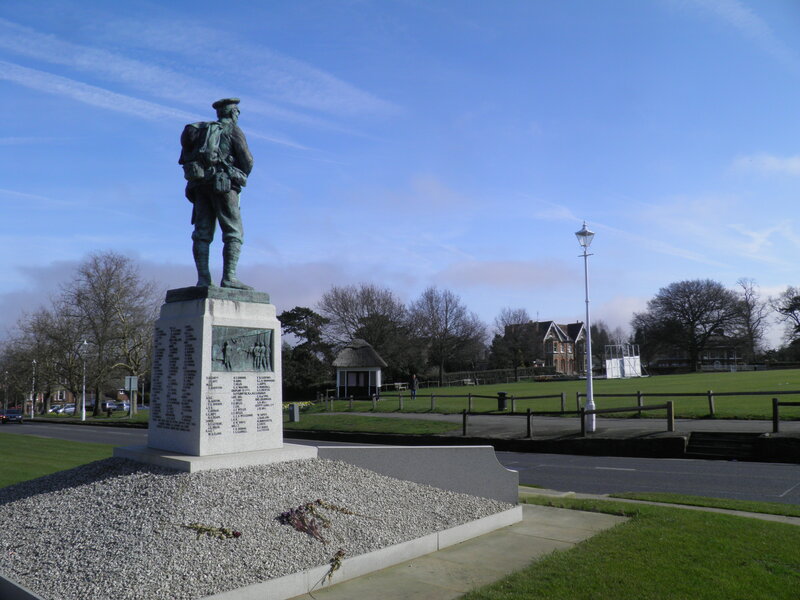 Cross the road to the memorial, then cross the main road beyond, heading left and then veering right onto the grass to follow the boundary fence of the cricket pitch. At a minor road on the far side of The Vine, turn left, then quickly right at a crossroads, dropping steeply to another junction. Head left here, still descending. 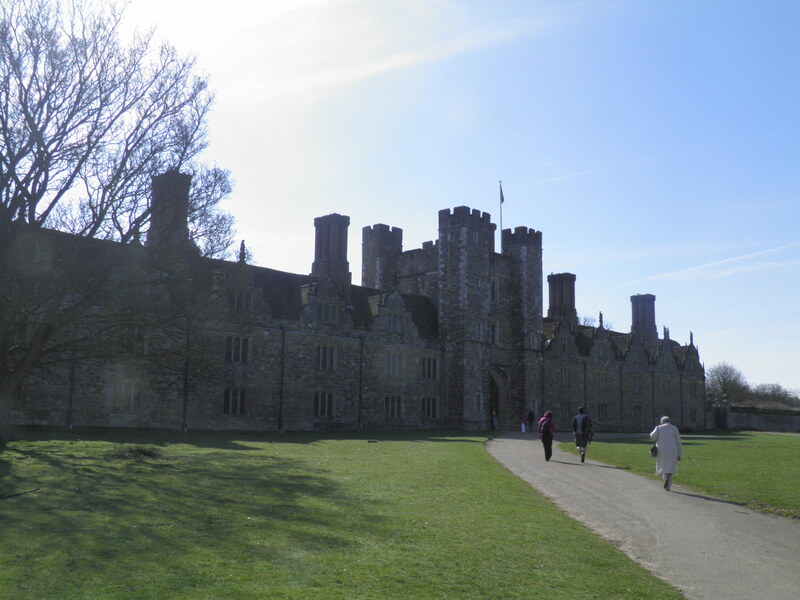 After around 200m, pass right through a wooden door in the park wall (footpath sign) and into Knole Park. 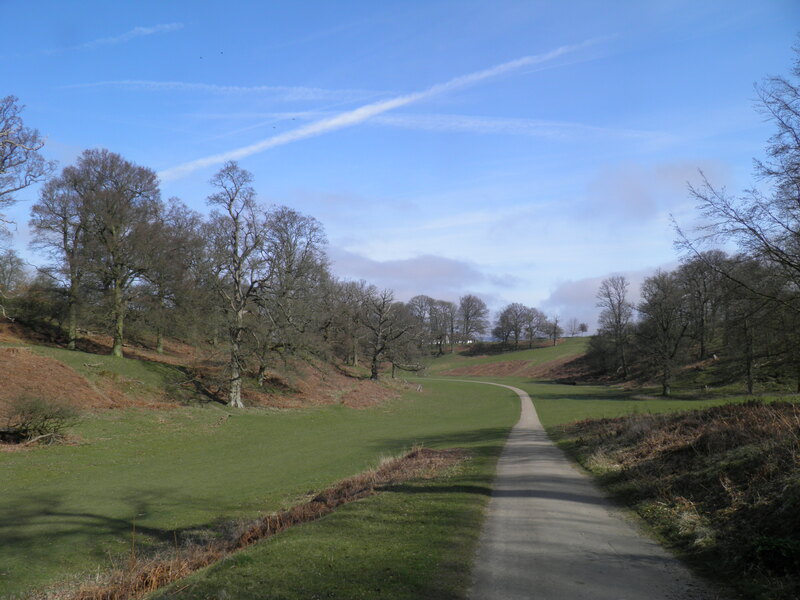 The stunning landscape of the 400 acre Knole deer park – comprising woodland, valleys, and heath, has barely changed in the past 400 years, with the exception of losing around 70% of its trees in the Great Storm of 1987. 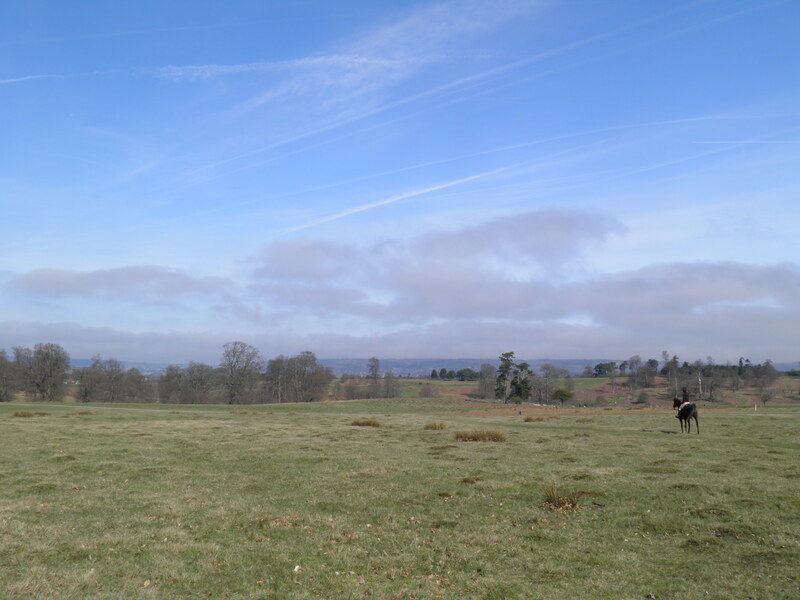 It is home to a fallow deer herd which has been present here since the 15th century, and the more recent addition of a herd of Japanese sika deer, from the late 19th century. Join the tarmac path ahead and follow it left, heading up a small grassy valley. The path soon climbs out of the valley and curves leftwards through the sparse woodland. Cresting a rise, the turrets of Knole House suddenly come into view just ahead. Keep straight ahead on the road through a car park towards the gatehouse. (as many large mansions are claimed to have) 365 rooms. To continue the theme, it is also said to have 52 staircases, 12 entrances and 7 courtyards…! The basis of this house was built in the late fifteenth century by an Archbishop of Canterbury, though much of what you see today is of early 17th century origin. Since 1603, Knole House has been the home of the Dukes of Dorset, the Sackville family – the most famous member of which family was author Vita Sackville-West. Sackville-West’s friend and lover, Virginia Wolf, based her novel Orlando on the history of Knole and the Sackville family. 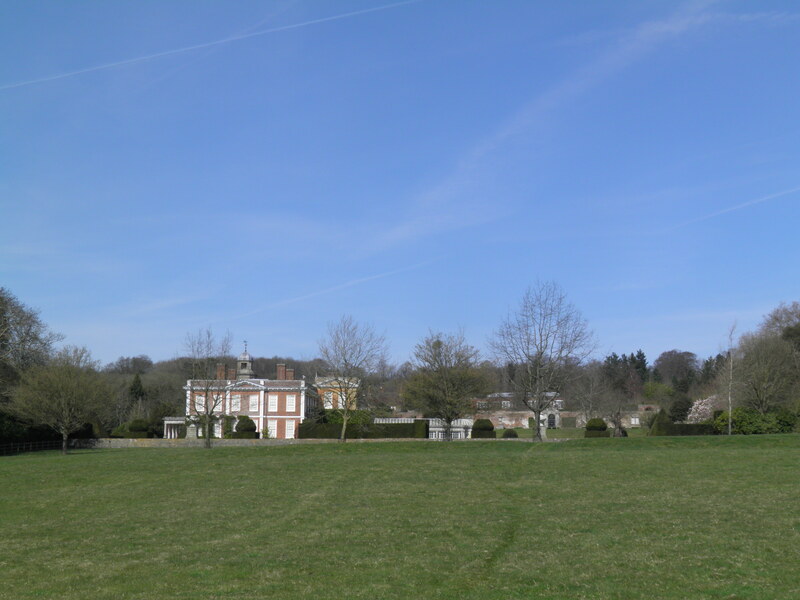 Around half of the house is still owned and inhabited by the Sackville family, the remainder being owned by the National Trust and open to the public. the tearoom) passing the impressive buttressed wall of Knole House. By a little turning circle at the top of the rise, leave the tarmac path at a waymark post, following the left hand of the two arrows on a faint path across the grass, passing through a row of trees. 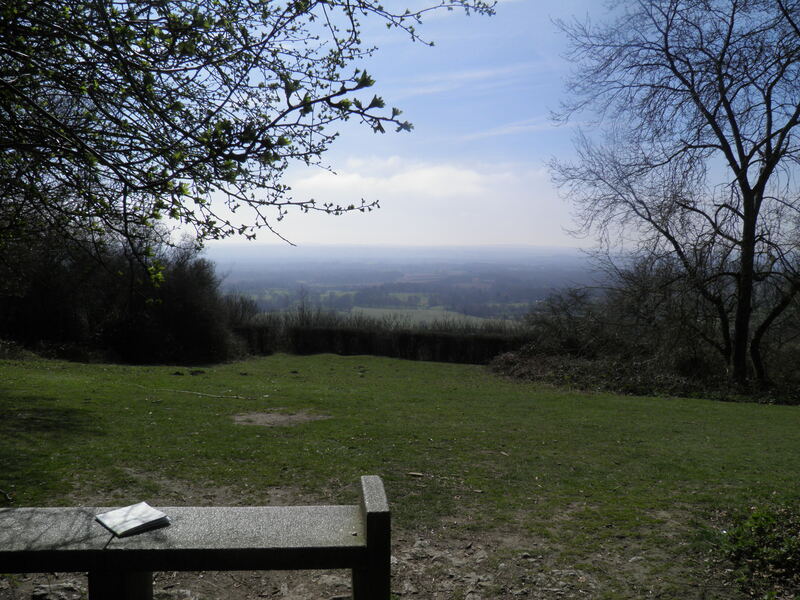 Fine views across the park to the North Downs and the Darent Valley open up from here. At a sign marking the edge of a golf course, follow the path to the left to soon reach a tarmac track, which you walk along to the right, across the well-landscaped course. Keep to this track through a small valley and past a little pond (complete with duck house), to eventually pass through the deer fence and out onto a road. Cross and take the minor road straight ahead (signed to Under River and Hildenborough). Follow this quiet road through the woodland and then past some of the villas of Carter’s Hill. Tonbridge and across much of the Kentish Weald. 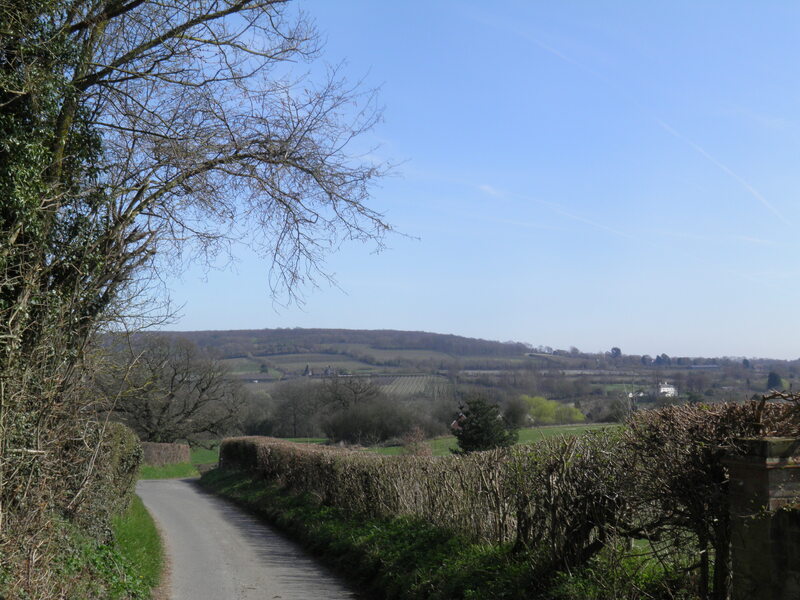 You are now on the edge of the Greensand Ridge, a range of hills forming the northern boundary of the lower-lying lands of the Weald in Kent, Surrey and Sussex. 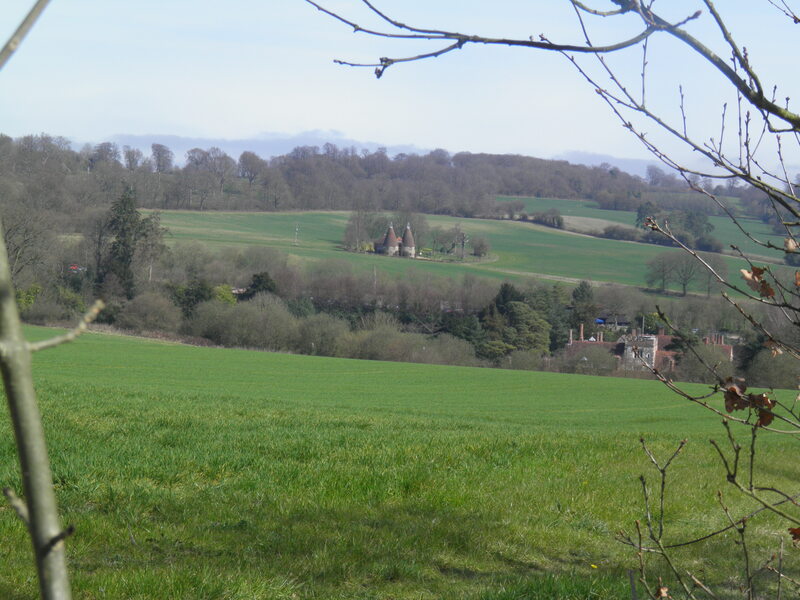 The ridge is the remnant of a ‘dome’, created as part of the geological process that formed the Mediterranean – the centre of the dome eroded to create the Weald, living a ridge around its northern edge, formed of Lower Greensand sandstone. Turn left here, following the Greensand Way (GSW) waymarks. Join a larger path, then at the corner of an orchard the route begins to descend, leaving the National Trust land. This delightful path meanders through the woods along the top of a precipitous escarpment, until it descend to reach a steep road by Rooks Hill Cottage. Keep straight ahead as the track climbs over a small hill then drops gently, the roofs of Ightham Mote now glimpsed amongst the trees in valley to left. By the oasthouses of Ightham Farm, you swing L to the road, passing a farmyard which is often home to some fine free-range hens and pigs. Turn right at the road, then very soon left through a gateway (footpath waymark) on the drive towards the Mote. You soon swing to the right, alongside the house and moat. At the top of the rise, you can access the visitor entrance and cafe through small car park. Otherwise, continue straight ahead on the hedge-lined path through the fields. On reaching a gate, follow the bridleway waymark rightwards beside the fence. After the next gate, turn left on a track (signed as a permissive bridleway) to reach the fast A227. Cross with care and take the tarmac drive opposite into the Fairlawne Estate. At the bottom of the hill you reach a junction by a fine ornamental pool. Follow the bridleway sign on the road to the left, passing another pond and Fairlawne’s stable block. In front of the stable block follow the signs to swing sharp right, and through a gate into the open fields, Fairlawne House visible to your left. Henry Vane, Secretary of State to Charles I. It is thought to be the inspiration for Shipley Hall, the home of Lord Uffenham, in P.G.Wodehouse’s Jeeves & Wooster. The house and estate are now owned by a Saudi prince. At the war memorial, turn left on Tree Lane. This takes you into a hinterland of the village, studded with fine historic houses. Pass the rectory, and at a road junction by the fine ensemble of historic houses, turn right on Grange Hill, dropping past half-timbered Nut Tree Hall and Georgian Grange Hall (with some impressive topiary) with fine views of Mereworth Woods on the hill ahead. the edge of Plaxtol Spout. Cross the road and take the footpath opposite. Drop to cross the pretty River Bourne, then take the path straight ahead, climbing gently up the field edge. A little footbridge leads you into a scrubby area, populated with hundreds of rabbits. At the end of this area, follow the left-hand path at the waymark post, climbing steeply towards a house. A stile brings you out by a tennis court and onto the road beyond. Turn left, past Old Soar Manor. Old Soar Manor, set in a little hamlet, is the remains of a 13th century fortified manor house, built by the Culpepper family of Aylesford. 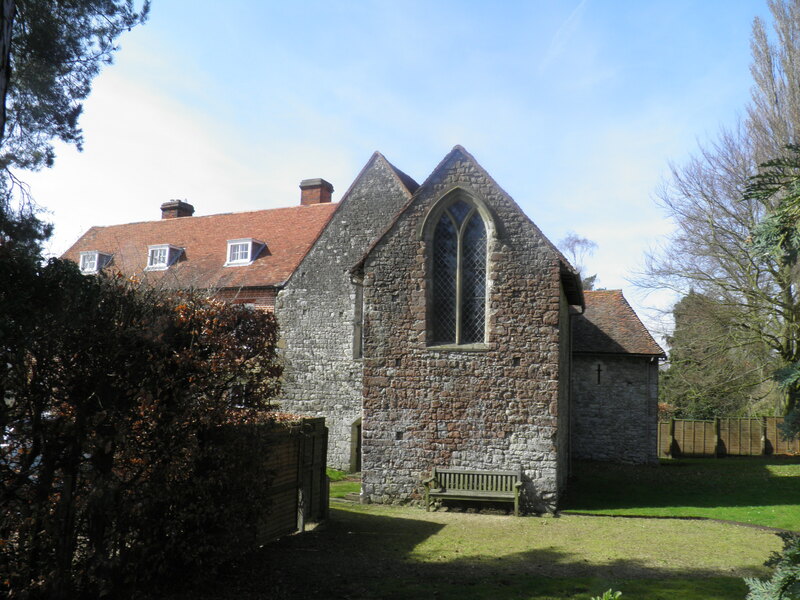 The remains include an undercroft and chapel, and are now attached to a large 18th century farmhouse next door. The Manor is open daily April-October (free admission, but donation welcome). 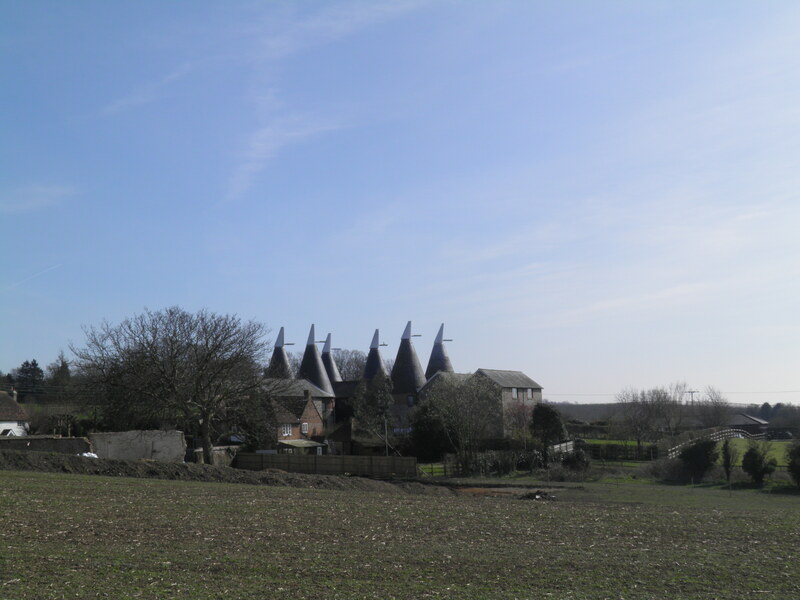 restored oast towers at Winfield House Farm. At the crest of the next hill, turn left beside a gate onto a footpath, descending on a faint track. At the bottom of the field, the track swings right to eventually reach a road on the edge of Crouch. the river. 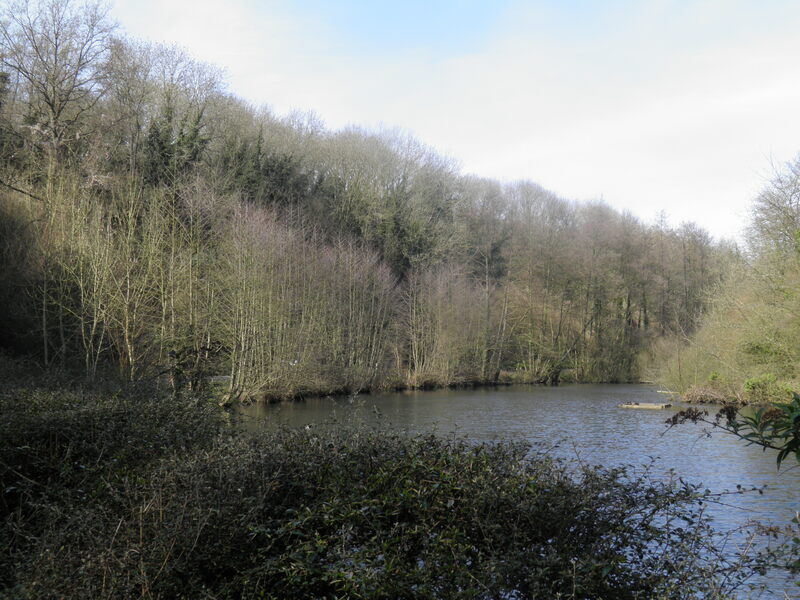 At the end of the houses, you follow the shore of the beautiful mill pond, filling most of the narrow valley. Just after a picnic area, turn right on a footpath. The path crosses the stream on a tiny bridge, then climbs steeply through the wood. At the top, you pass along the steep edge of a former quarry, which is rapidly returning to nature. The path crosses a drive and drops past the back of the first houses of Borough Green. Cross a road, and take a tarmac path ahead. This soon becomes a small road – at the end of this, opposite a chapel, turn right. Cross the busy Maidstone Road at traffic lights and continue straight ahead on High Street. Past the row of shops, cross road opposite Barclays Bank to take path down to London-bound platform at Borough Green & Wrotham station. 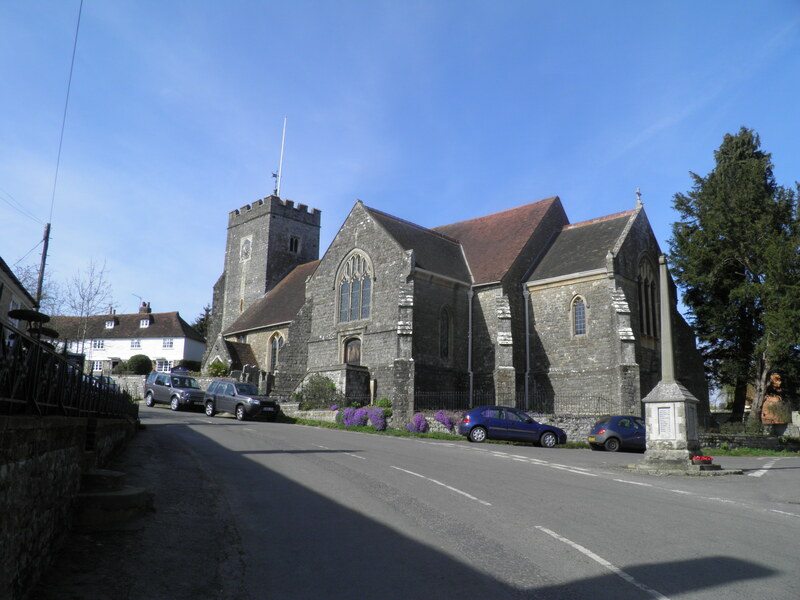 The village of Borough Green is much expanded since the arrival of the railway in 1874 – originally the area would have been a few houses around the green of ‘the Borough’ – referring to the more historic village of Wrotham a mile or so north. 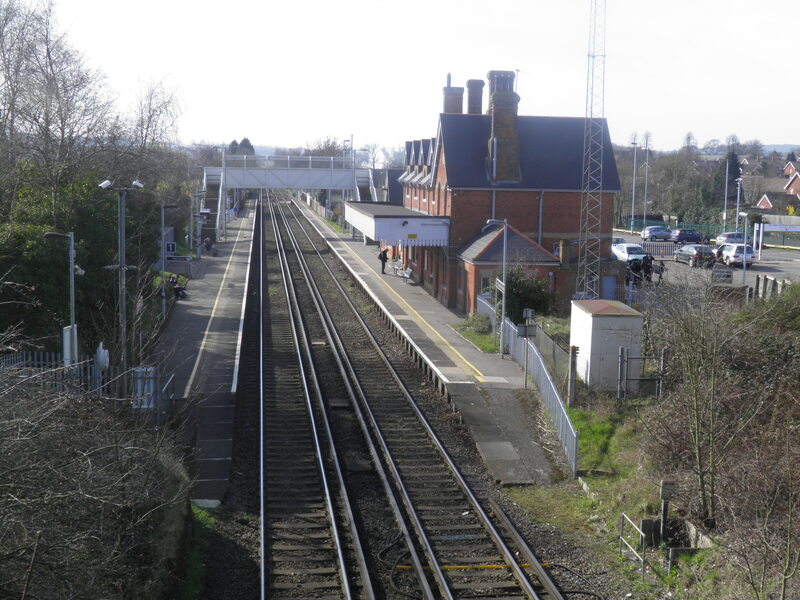 When it first opened, the station here was called Wrotham & Borough Green. The names swapped around with the shift in importance! All directions very clear and accurate as of February 2016. Thanks for all the brilliant routes, information and effort you must put in to collecting them. I have done four so far and they’re perfect for a day’s dash out of town.